Back in 2010, when Brian and I moved Virginia, one of my biggest reservations was moving from New York, a state with relatively good legal protections for our relationship, to Virginia, which not only had a spectacularly vindictive anti-gay constitutional amendment, but also had a spectacularly colorful history of being on the wrong side of diversity and family issues. I was excited for the new chapter in my life, excited for the job at UMW, and excited to try living in the quaint little town of Fredericksburg. But Virginia … oh, Virginia … so beautiful, and so backwards. At the time, we thought a lot about our options, and even seriously considered living in DC, not because we liked the city, or the commute, but because at least our relationship would enjoy legal protections at home. We ultimately decide against that course of action … DC culture, housing prices, and traffic being what they are … but it was still an ongoing concern. But with the drumbeat of course decisions since Windsor, I have become more and more confident that if we just sat tight in Virginia, legal recognition would come to us. And tonight, I’m vindicated. 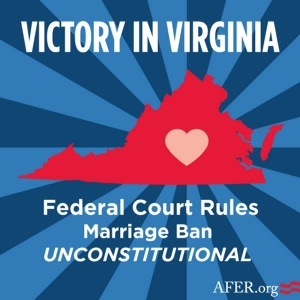 Judge Arenda L. Wright Allen of the Eastern District of Virginia in Norfolk has issued a decision declaring Virginia’s gay marriage ban unconstitutional. We have a long way to go … this decision is only at the district court level, and it’s been stayed pending appeal … but people, we’re on our way! Edited to add: but couldn’t she have waited until tomorrow, for Valentine’s Day?